Pre-treatment records are taken prior to the initiation of orthodontic treatment. All of our patients' study models are placed in centric relation on an articulator. An articulator is a calibrated instrument which is able to simulate an individual's jaw movement. Centric Relation is the repeatable position that the facial muscles will position the lower jaw to the skull. Articulated models expose discrepancies between the way the teeth come together and the way the jaw closes aiding Dr. Wong in the diagnosis and treatment planning of orthodontic cases. Articulated models demonstrate where and what kinds of adjustments need to be made to the teeth and bite to more perfectly treat your case. Dr. Wong's main focus is to provide our patients with the best orthodontic care possible so that you may achieve optimal dental health that will last a lifetime. Teeth and jaws do not occlude (come together) in an acceptable position for many reasons. Some of them are fillings or bridges that have been placed over a period of years, orthodontics, oral surgery, trauma, malocclusion (poor bite), developmental defects, bruxism (grinding) and clenching. An occlusal equilibration is the mechanical adjustment of your teeth, dentures, bridges, fillings, or other oral appliances to a position that allows your lower jaw to function in a natural hinge in relation to your upper jaw without improper influence from teeth. Your mouth is being equilibrated because some problem exists: pain, abnormal wear, breaking of restorations (fillings), or tooth movement. The problem is usually present because the teeth and/or restorations do not meet in harmony with your lower jaw at the proper position. An occlusal equilibration "wears" some areas mechanically and allows the teeth to meet harmoniously. It is not harmful but is beneficial. How is an Equilibration Achieved? Dr. Wong will selectively adjust the occlusal (chewing) surfaces of the teeth in an effort to eliminate premature contacts and occlusal interferences. A simple occlusal equilibration can be accomplished in a short time and its a painless procedure. Only slight future changes in your occlusion (bite) occur over a period of time because small movements of teeth in the jawbones. More complex equilibrations may require several appointments, and the teeth may shift more between appointments. When your symptoms are gone and your occlusion is relatively stable, your equilibration will be finished. 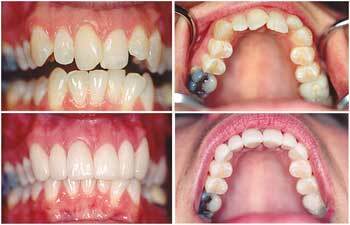 Placement of new fillings or crowns can also change the way your teeth contract. Be sure to advise Dr. Wong if your occlusion (bite) does not feel right. How will your Teeth Feel? After an occlusal equilibration, your occlusion (bite) will feel different to you. This is to be expected. You will gradually accept this location as your new chewing position, and it will feel good. Most patients report their new bite as feeling "weird", but in a good way: more even and more solid.